Spillway is the term opted to a dam appurtenance, which permits water to pass over or around the dam, a concrete structure that conveys floodwater from upstream of the dam to the downstream without dampening the dam or reservoir walls or toe of the dam. · Operates when the water rises over the maximum water surface. 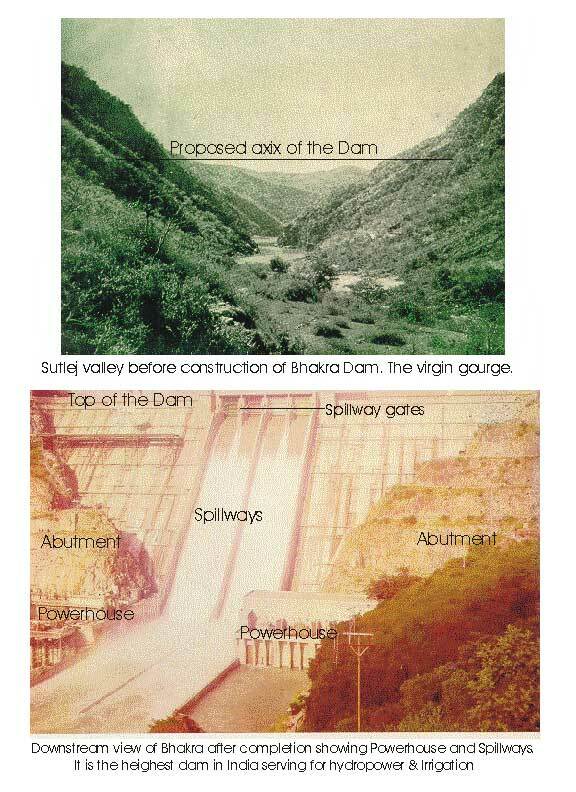 · In the simplest type – water is permitted to flow over the crest of dam – submerged dam. · Permit opening and closing the spillway. · May be automatic – by means of float system – gates automatically open when the water reaches a certain level. · In small dams – sometimes closed by stop logs or flash boards. Uncontrolled spillway – gates are not used. Types of spillways - Rectangular or Trapezoidal in cross-section. a) Normal/normal control spillway. Short cut channel followed by steep chute. b) Side channel spillway – where water flows over a weir that is perpendicular or at an acute angle to the dam axis & is carried past the dam by an open channel or tunnel running practically normal to the dam axis. c) Shaft spillway – (morning glory/glory-hole spillway) the excess water in the reservoir drops vertically or obliquely into a funnel and is conducted downstream more or less horizontally in a concrete pipe – generally under the body of the dam. Lip of the funnel is at the maximum water surface. 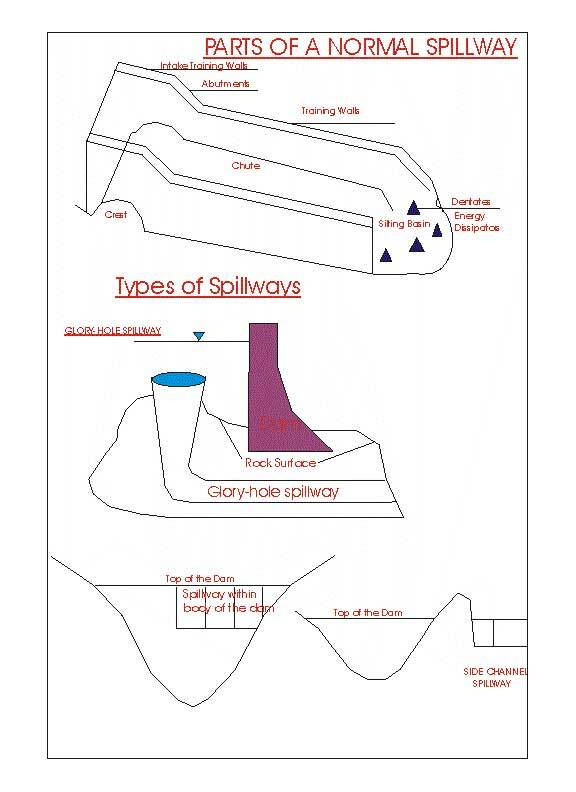 d) Ski-jump spillway – spillway has a projecting lip on the face of the dam (on concrete dams. This lip causes the water to "jump" into the air and land a safe distance downstream from the toe of the dam – thus protecting the toe against erosion. Crest – highest part over which water flows. Spillway chute – downstream portion of the spillway over which water flows. Intake training walls – training wall upstream from the crest. 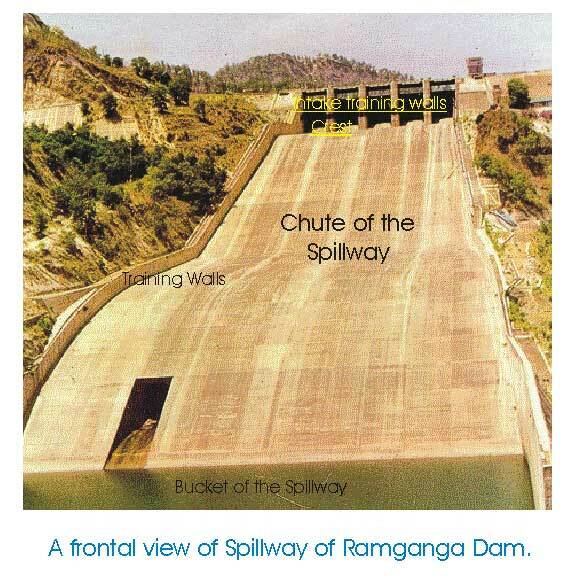 Silting basin – deep basin located at the bottom of the chute and is designed to reduce the turbulence of the spillway flow also referred as "spillway bucket". Dentates - the turbulence and energy of the spillway water sometimes are further. Dissipated by means of large, tooth like projection called as "dentate" or "energy dissipaters". Some of these terms have been shown in Ramganga photograph. Emergency spillways – This type of spillway is designed for extreme flood conditions – when normal spillway capacity might be exceeded – excavation with a low weir across its crest, is made in the rim. None of the other spillway appurtenances (chute walls etc.) are constructed. - Damage to the foundation may be expected. Outlet Works: (used in irrigation – to divert some of the water into irrigation canals, municipal water supply system and hydroelectric plants). a) Tunnel type – where water is carried in a tunnel lined or unlined through the abutments of the dam. b) Conduit type – water is carried in a pipe through or under the dam. Penstocks – for taking reservoir water to the hydroelectric generators. - Steel pipes of large diameter. Crossing the body of the dam. - The powerhouse may be either just at the toe of the dam or at a certain distance downstream depending upon the topography and economic conditions. 2. A narrow outlet requiring relatively small and economic dam with safe foundation. 3. Opportunity for building safe and ample spillway to dispose off surplus water. 4. Available material to construct the dam. 5. Assurance that the basin will not silt up in too short a time. 7. Use for stored water or other adequate condition to justify the cost of the dam. A reservoir is formed upstream to a dam. – Sediment coming to the reservoir is largely deposited in it and sooner or later – reservoir is silted – filled up with sediment and the usefulness of the dam is lost. The presence of the dam retards the natural flow and hence the water level in the reservoir is not horizontal but its surface is slightly curved (Backwater curve). When the river flow reaches the reservoir the flow velocity decreases and coarser particles such as sand are dropped close to the entrance. The beds formed this way are called foreset beds. Fine sediments are settled slowly across the area of the reservoir. These are known as bottom set beds. Foreset beds obstruct the flow still forthcoming from the upstream and formation and propogation of topset beds occur. As time goes on the foreset beds advance into the reservoir to form higher & higher slopes, which because of its height will not stand so steeply as the slopes formed earlier. Hence the high slopes of the foreset beds have to flatten out and cover a part of the previously laid bottomset beds. This causes an intermixture of coarser and finer sediments at the bottom of the reservoir. The location of future silt deposit in a reservoir can often be predicted. iii. The reservoir is short and has a steep slope to the original valley floor. v. The dam has small outlet at higher elevation. i. The conditions are converse to above. · How long it will continue to store a useful amount of water - length of time the water stays in the reservoir before being used. · The rate with which the sediment accumulates from year to year and is not removed by natural devices. · If the storage space become less – these is an increase in the rate at which fine sediment leaves the reservoir. · Silt at a high level in the reservoir – removable by dredging (though costly) silt in live storage. Silt in dead storage (low level) cannot be removed. · Reservoir life can be extended by sluicing operations the outlet gates are opened at appropriate interval and the high velocity flows carry some of the sediment downstream. · If this is timed to intercept gravity underflows – the sediment removal can be very efficient. However, it is ineffective about the sediment, which is already settled. Trap Efficiency: is the % of total inflow of sediment retained in a reservoir (per unit time)/year. It depends upon the ratio between storage capacity and inflowage of reservoir, the age of the reservoir, slope of reservoir basin, the type & method of operation of outlets, the and grain size of sediment and its behavior under different conditions. C – Proposed reservoir capacity in acre ft.